Today’s interview features Pat Flynn of Smart Passive Income. Pat got into entrepreneurship after being let go from his job and hasn’t looked back since. He’s very transparent about everything he does and has a knack for helping others achieve success. In this interview, you’ll learn some strategies and tactics he uses to stay productive. Batch your work – for example, I choose to do all of my interviews on one day of the week so I can knock them all out. Similarly, I might decide to work on my top priority for 90 minutes and then take a break before moving onto my next task. Eric: Hey guys. 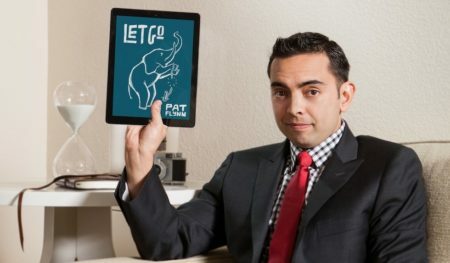 So today’s interview is with Pat Flynn of smartpassiveincome.com. He’s a very interesting person. He shares all the tactics and strategies he’s learned from online marketing, to SEO, to podcasting. You name it he’s always willing to try new things. I think this is very valuable to any stage of entrepreneurs from startup to more experienced entrepreneurs. He’s also I think it’s very interesting he’s very transparent with his revenues as well. He’s always sharing like his monthly income report at the time I interviewed him he did like $144,000 for that month in revenue and you know you can see on his blogging shares you get each one that is broken down that’s very organized all the resources he uses so be sure to get a few take aways from this one. And I think you’d really like it. Eric: Hello everyone. Welcome to this edition of growth everywhere where we introduce and interview and bring you tips on business and growth and personal growth. Today we have Pat Flynn who is a very popular blogger and he is also a speaker an ebook writer and there is a whole bunch of different things. So Pat how are you? Pat: Doing awesome Eric. thanks for having me. Eric: Great! Pat you want to tell us a little bit of you know your background how you got tehre kind of like a brief overview of how you are where you are right now. Pat: Sure I’ll try to be brief. Uhm I started in school of architecture. and which has nothing to do with what i do now. but the path of arch and going to school of arch now encourages you to. I’ve got a great job coming out of college in the architecture industry but in 2008 i have gotten laid off. and it was really unfortunate that happened because at the time i have created a site to help me pass an exam. Before I got laid off to pass to pass an exam, I created the site help me keep track notes since i was helping a couple of co workers. I never planned of turning it into a business. but after i got laid off and after some f researching internet marketing and online business i discovered this podcast called internet business mastery and it is on that podcast i heard an interview with a guy named Ramelius who makes a really really significant living teaching people how to pass project management exam and what I like all went of off me. I had this resource already to help me and a couple of co workers pass this exam. maybe i can share with the world and who knows maybe it could turn into a business but the 1st thing i learned if you have a website u want to get traffic coming into it and u have to keep track of that traffic somehow so I put in an analytical tool on that site to sort of to get ready for the traffic that i was hoping to get i didn’t know how i was gonna do it but it was really crazy coz of the next day when the stats populated on the analytical tool i saw that thousands of people around the world were already visiting my site everyday and I don’t have any idea how or why this is happening but apparently i have written so much stuff I actually written content on the site for all over a year preparing for this exam after i passed i just let it sit there for over a time google picks up a lot of the content people started finding it and sharing it and digging deeper into analytics i saw that a lot of you know really high end arch forums were linking to me and even some of the even chapter websites from the company that actually administered the exam were linking to my site has the resource as well. when in October of 2008 that’s when i published an ebook to serve help guide my audience that was there to prepare for this exam. There was no other electronic guides out there there was a lot of big thick you know expensive guides could nothing serve on a lower end so i filled them that hole in that 1st month of October of 2008 i had generated 7908.55 cents from selling a 19.99 e book and it just blew my mind that all this happened and it was even possible and really would have changed for me was not only sort of you know my life because I was making more money than i was in architecture but it changed my perception of how business can be done online. prior to all that stuff I had this pre conceived notion that you know that doing this online was a sort of a scammy scummy snakeload type of industry. Snake load field type of Industry because I have researched it before and It was just very much based of exaggeration and hype but here I was, I wasn’t doing any of that I was just simply sharing resource that I built to help those people not only I was making money as a result of sharing this and helping them pass this exam I was actually getting a ton of Incredible super lengthy thank you emails and actually a lot of handwritten notes too. If then. In this site It has exploded I have Incredible numbers In as far as traffic and subscribers also a podcast to go along with It I just passed 41/2 m downloads a youtube channel and over 20k subscribers and almost 2 million views I believe Its just been an amazing journey I have remembered other business from the iPhone app business from the ebooks I have created and you know websites In the security Industry I’m building one for food trucks right now Its just all over the place but Its because I love It I am an enter I have all these Ideas and I do what I can and execute them and learn from my mistakes. Eric: awesome. lets talk a little bit about the revenue numbers last month and that was phenomenal can you kind of reveal to the audience how much you made last month overall. Pat: Yeah last month was pretty ridiculous I had grossed over 6 figures that was my 1st time at having a 6 figure month 114k which is I can’t say it correctly because It is just unbelievable but I netted about 99/98k after expenses I had sort off bills to pay and also certain bills and things Iike that really Into my business but I mean gosh that was more money than I could have made In 2 years working In architecture in a single month I mean it’s just amazing I mean I did you know it’s not always that was the 1st time I broke 6 figures In a month and It was due part largely to the release of the course I just came out with for my audience as well. typically Its between 40 to 60k a month taken In August I haven’t come up with a report yet but It’s about it’s around 70k so Its high and it’s up there so doing really well business Is great. but then again numbers are not the what’s most important to me. It’s the lessons learned and what I can share from what I have learned along the way obviously the money Is great and its helpful as far as living the lifestyle I live I have 2 kids. Eric: beautiful, yeah. you know, not a lot of people can say that. It seems that you have a very good balance between work and family. can you kind of walk us through how you balance that out? Pat: sure. i mean i always kind of remember why i do what i do and i think that helps to guide me because a lot of people, they become an enter and they forget why they want to be an entrepreneur and life is being an entrepreneurs as opposed to being an entrepreneur seek and live life. and for me that’s hanging out with the kids with my family. so that’s always what i do for us. Ii always give to my family first and then work later. so most my days that I’m with them, i have two young kids and my daughter just turned 1 and my son is about to turn 4, obviously they’re not in school yet, i want to make sure i give all my time for them before they, you know, go off to school and i don’t see them anymore and they’re teenagers and don’t want to see me anymore. so trying to establish a strong foundation in the family there and I do most my work at night and i do have number of reasons: one, it’s just with two crazy kids in the house it’s most easier to get work and then focus. so i don’t even think about working. so later in the evening once they’re down to sleep around 8pm, and that’s when i can really focus and i sort of figured it out also that’s actually when I’m most creative. so i don’t even try to force work in to times where work is not on the right time of the day for me. so i had to work with my body and my mind to produce the best outcomes that i can. but there’s also a lot of, you know, it was a learning process. It didn’t always happen and it wasn’t always down. let’s say yes you could say, I mean, especially at first even before I had my two kids and I just started my own e-biz , I remember being married and getting to a point where I was working way way too much and i wouldn’t even have conversations with my wife sometimes and at the back of my head even though I was talking with my wife I would still be thinking about my business or the next thing that I had to do or e-mail I had to answer later. like, I know that’s very common for entrepreneurship and that wasn’t fair for her so we had a nice, sort of discussion about that and i soon learned that I was not, you know, that pretty much entrepreneurship in front of everything. and so there was certain things i needed to do to better balance and sort of create that line between personal life and work life and there are certain things that actually worked out. First thing I did was at create a schedule. now I always know we talk about like escaping the night but working for myself, searching from home, I need that schedule, I need that structure or else I’m not when gonna know when it’s personal time, I’m not gonna know when it’s work time and let it all flat and it’s not fair to those people around me and also not fair to myself. so now that i have the schedule, when I’m in work mode and it’s time to work like this right now, i can switch my brain to work mode and turn everything else off and get it as much done as i can, be super focused and productive and when it’s time to turn it off, i just put work aside and just focus on my family so it’s actually really helpful. another really helpful tip is actually creating a separate physical space due work. So not only having a certain time with your work but it’s actual space . so when I’m in this space, i focus on productive and focus on work. when I’m out of this space, I can close the door, luckily we have an extra bedroom in the house, like it turned into my office. i can close the door and when the door is closed, my mind turns that part of my life off and i can go to things that needs to. Eric: you know, that’s funny because i actually have a thing with my girlfriend where it’s like if i go into certain area like we just cannot talk to each other until like that person comes out. you know, it’s kind of like a bubble. Pat: you know like that, yeah. clearing those boundaries, it’s really important. and probably the biggest thing i learned from all that was you have got to communicate with people around you just like you talk to your girlfriend about that. so everybody knows what they had to do or what they need from each other. it’s the most important thing. Eric: yeah. and you know, the thing is a lot of entrepreneurs, they turned into workaholics and they tended like, you know, neglect their family at the end of the day and it all takes really what I’m getting from you is it just takes a little effort to kind of put these processes into place so you don’t kind of forget about your family. is that right? Pat: yeah. absolutely. i mean sorry if we forget about them but it’s just like you’re always thinking about your business. i mean, working for yourself, it’s really hard to turn it off because you could always do more. it’s not like a job where you can just lock away and want to go away from it. as an entrepreneurs, you want to keep working on your business, you want to keep trying and prove yourselves and do better. it’s just so hard to turn that off, and yes there are times when I’m in personal time, you know, i might be like an amusement park or something and I’ll get an idea for something that i need to do. You know, you can’t help do that. you help but do that. but there are certain things i do like just keep track of those random ideas that come , I had, or you know quick little to-dos that i know i remember that i had to do later. I put them in a note. and that’s sort of my bank for things that i had to do later when I’m in work mode. and that’s my way of not turning off completely because sometimes vast ideas come out at random moments of the day. you want to make sure you’re gonna keep track on that so i use evernote on my phone to keep track on that. and when it’s work mode, the first thing i do is go on evernote into my inbox and separate everything, put it in certain notebooks and i need to go away and act on anything i need to act on. Eric: and i use evernote a ton too so i can, you know, plus one a Pat’s recommendation here. so i guess you’ve been building that brand since you’ve been laid off since 2008. so 5 years. for people looking to kind of get started, even back tracking a little bit, for someone that wants to become like the next Pat Flynn or whatever, do you think the ship has sailed or is it really possible for anyone still? Pat: when i hear the “become the next Pat Flynn”, like you don’t want to be the next Pat Flynn, like don’t be like me. don’t be like anybody else like yourself so I know what you’re trying to say when you say, you know, be the next Pat Flynn like it’s so online, is it still possible to create a brand like that? absolutely, people are doing that everyday now with different things and different natures. you just, you know, there are more tools available now to do that and tools that make things easier than they were ever before. i mean, if things were like now when i first started i would have gotten off the ground much faster and are in to. i mean my audience much better. I think it’s a really a matter of finding your niche, a market that needs help. it could be a market out of people are into. i mean it’s actually good sign if there’s other competitors out there who are providing some service or tools or information, software or whatever particular market because you know that there’s a market there. we’ll go in there, it’s not if it’s something here just sit in, you know, and just be a customer and see what’s missing. you know go through that experience where be a part of that target audience just try to find the real missing elements and the one to provide that solution. I mean that sort of happy approach meant taking you right now because there’s a little trick in the industry. this website that i am creating, you know it’s sort of a sort of a fun little challenge, challenge I’m doing publicly Smart passive income make out my website from scratch, and buildings, websites from scratch, and I’ve found out that through my research that the food truck industry is still so new and a lot of people aren’t just met and there isn’t any good centre location for information how to start one or you know, the business aspect of a food trucks and there are a lot of things that i learned about this industry like simply going up to people and asking them. I freak with the food trucks here is San Diego every week, twice a week in get together in starting areas and i go there and I talk to the owners. and i find out exactly what they would, what would improve their signs as a food truck owner. and it’s just amazing, the things that you can learn when you ask people in a particular market. you know, what’s missing and if you can go in there and fill in that void, i mean you’re gonna be that thing that people talk about and share and spread around and like i said, tools to do that or more gradually available now than ever before. it’s just a matter of doing work and putting yourself out there and experimenting and understanding that it’s not gonna be a strong hold. it’s a long process, i mean a lot of people hear my ebook story, how i mean I made 8gran the 1st month I launched it. They forget that i spent a year, two year and a half, like building that business or creating that drive without even knowing it of course, but i was writing every single day i was building an audience behind the scenes and provide information for them that they needed. it was just fortunate that i learned that they were there once i opened it up and began them on its heist but again, it takes a lot of work, and a lot of time and you just got find that market find out what their main points are to be able to provide for them. Eric: and it sounds like, you know, the theme and i see this with a lot of, you know, a lot of entrepreneurs. like you’re doing this interview with me right now, there are entrepreneurs that responded like every single interview and all that, they’re always trying to you know, help other people kind of pay it for and provide it as much value as you can. like you said, it’s not so much about the revenue. it’s as long as you provide the ton of value, you know, that money’s gonna come in but it’s all about value first, is that right? Pat: yeah, absolutely. it’s understanding what is actually your target on it’s needs and providing for them and they’re gonna pay you back one way or another if you can actually help them out. you know, I’m at the point now where people are like, okay, when’s your product coming out? i just wanna get it. i don’t care what it is. you just gave in so much to me and now that i just wanna pay you back. i mean, i mean that large reciprocation is there. if you could give and you could go out all the way to give, a lot of those people are gonna give back. Ii mean the same thing happened with my lead exam when it first came out because a lot of people who where on, you know, that website, you know, they have already passed the exam. they were using it to help them further actually apply that information and they saw me come out with this book and they bought it anyway even thought they passed the exam. i got dozens of e-mails from people saying how i passed the exam, i don’t need this book, I’m not even gonna open it but i wanted to pay you back for all the information you gave me. i felt like i had to do this. and i thought that it was really really cool. i mean, i didn’t understand it at first. I’m like you could have just walked, you didn’t have to say anything. they showed me that people, i mean, true genuine honest people and there are many of those types of people out there. they’re gonna want to pay you back if you serve them one way or another. Eric: right, absolutely. and you know, you would get, you know, your blog or Neil Patel’s blog is a big internet market or even John Duma from entrepreneurs on fire. it’s all about giving as much as you can and then hey, you might get something back, you might not, who knows? you probably will though but i think that’s a very very good lesson to take away. so on the tactical side of things, you know, something to take away for people looking to build their blog or their brand, what would you say that where kind of the most effective tactics for, you know, growing their blogs in the first two or three years? Pat: well in the first two to three years, it is really important to be present on your blog and once i started to respong on every single comment and be there and answering to actually reach out people who were there in the beginning. actually things started from a tick off, i mean, i think in the beginning, that’s when you do have the opportunity to do that because right now, it would be impossible for me to respond on every single comment, in every single e-mail now. But in the beginning it’s really important to be present to show people and that you’re there as the blog owner or as the brand and that you’re there and listening to them because they’ll be attached to you. as a result of that you just, you know, write a blog post and people will comment and you don’t respond, i mean, they’re never gonna know if you’re actually listening to them but if you respond, that’s how they know you’re listening and that’s gonna differentiate you between everybody else. and yes some of those people might not resonate with you and your particular style and that’s okay. But the people who will resonate and are gonna be there and follow you if you show yourself a little bit. and that’s another thing i kind of did. you know, i know i did a lot more than other people. i shared a lot about who i was. you know, outside of this, my own personality, who i was, a lot of people know i had two kids, a lot of people know i play fancy football, and was in the marching band, and that how, you know a lot of me. those are things that like have nothing to do with all like this. It has nothing to do with building a real relationship with people and the approach is you should take with a plan if you really wanna build a real relationship with those people because that’s when people come back, that’s when people share you because they trust you with their friends and followers. that’s when people will buy from you. eventually you’re on a roll because they trust you and that trust can only happen if you build that real relationship. so that goes along with replying on every comment but also because with you know, asking questions and opening lines of communication between you and your audience. 20:09 as a strategy. on my email list, when people sign up, i think it’s the third or fourth email, the question i… i actually ask people on my email list questions so i engage with my audience on my email list. a lot of people don’t do that but i ask them a question. i’d say “what do you want me to write a blog post about?” or “what are you struggling at right now?” things like that. and now we got a constant stream because new people are subscribing everyday. I get a constant stream of emails everyday from my audience telling me what it is that they want me to write a blog post about or what questions do they want me to answer or what are they struggling with so i’d know what my audience wants and sometime if I get, you know, multiple people saying the same thing, i’ll create a video that’s like a highest quality form of content and i’ll answer that specific question. and when i do, i’ll put it on youtube, and i get the link, and i send it to everybody who asked that particular question. and i’d say “hey, i made this video for you”. So those people become super fans and it’s they’d say “wow, you created this video to answer my question? like, thank you.” but at the same time, if a lot of people have the same question, if a lot of more people who are not even on our blog yet are gonna have that same questions, well are you gonna be there to answer them? and one particular video right now, way back in 2009 when i created my youtube channel, it answered a question how to create a facebook landing page and it’s something, you know, people go to your facebook page and they go to a particular page instead of your wall because you can have people do certain calls and actions like like your page or became a fan. and so i created a video on how to do that. like 5 or 6 people had that same question, did the same things. I have done on that video. they were extremely in gratitude and happy with that but that video…and actually i had to create two other ones because facebook kept changing the way to do that but those three videos combined that i talked about on how to create a facebook landing page mounted to over 750 000 views and it was just crazy how a just simple answer for somebody that had a question amounted that many views and honestly, there were mentioned description and actions in the video on how to come back to my site as well. so that’s a very good strategy and that definitely increased, like you could see, in my analytics. and an increase in traffic because of youtube. you know on that, i created a podcast. a similar fashion on monitoring traffic plateau after youtube and it was a higher plateau of course, but i was looking for other ways to reach more people and that’s when i decided to create a smart passive income podcast. and i always knew a podcast was great cuase like what i talked about earlier, in the beginning, it was a podcast internet business passive podcast that kind of got me to take action and helped me realized what was available. So always knew that a podcast was a great way to reach people but i had no idea that it had this kind of impact on my brand and I did a survey on my blog in 2010 or 2011 actually i really ran a survey but I’m prett sure the nembers are still the same. if not, even more surprising or higher. I asked my blog readers “how did you first find out about smart passive income or Pat Flynn?” and the number one answer was through my podcast, through itunes. 20% are verified people who are now reading my blog found me through my podcast. number two was youtube, number three was links on other sites. and number four five and six, that’s google, facebook and twitter which is where we spend most of our time reseraching or focusing on social media and seo. but it was those components that were extensions on m brand outside of my blog. podcast and youtube that actually drew in most of the size. so those were specific thing i did to increase me exposure in the beginning to get to this point where i am at now. Eric: yeah, i think what I’m getting at or what I’m taking away here is that you gotta be one to experiment what new things.. like, you talked about youtube and you know, itunes being your top two traffic sources like most internet marketers would never think that right. it’s gotta be google, it’s gotta be facebook, whatever, right? i look in the background, like there’s cameras and stuff here always like going all out with like, video. you’re trying youtube, you’re trying itunes and all that. so like, what… i mean obviously it’s very daunting for people to try new things so what would be your advise to people that are too afraid to you know, experiment? Pat: well you have your blog, probably, right, where you’re writing and that’s good. you have to have your blog that’s sort of a hub. that’s where it will drive the traffic back to you from all those different media sources. you gotta experiment. i mean, you’re getting people but you’re not reaching as many people as you could if you don’t experiment and try those things. think about this, you have a message that could provide value and actually help people out. you can actually change people’s lives from your message. I’m not experimenting whether because you’re fearful or you don’t know where to start or you don’t wanna ask for help. you are doing, those people who could benefit from your message a disservice. you’re being selfish by not doing that. that I’m just saying that’s my trick i play to myself. I got all the types of ways that people could consume contents so people will have no excuse not to put Pat Flynn in like, one wa or another, you know, they have all the ways to do it. and if you’re just starting out you can be tempting to do all three blog podcasts on youtube at the same time, i will not recommend you doing that actually, i would do what i did which is start a new blog, focus on that, get it to a point where it’s half full by adding something else on it and just pick one. pick a youtube channel or a podcast. and start with one until you get comfortable with it and when you can get to a point where you feel comfortable, and it makes sense for you. and if it does, just add another, like into your brand. I’m actually at the point now where, you know, i have those three channels working for me, i brought e books, and i tried amazon to get more exposure as well, I’m actually thinking of doing a monthly webinar. completely free, no pitch, whatsoever for my audience as well. another way to provide value, another form of media, another medium to be able to find my audience and also it puts me at that higher level. “hey, you going to Pat’s webinar this month?” or you know, just like how people listen to my podcast in youtube video, I’m not just a blog anymore. I’m actually…I’m a brand. i have all these beautiful components but i didn’t start with all these different components. i started and took it one step at a time. Eric: got it. so test everything, do things that make you feel comfortable. Pat: yes, but as far as like, you know, if you’re trying to decide whether you wanna do an audio podcast or a youtube video, start with the one that you’re most comfortable with. yes, both could be comfortable and it’s good to be comfortable. I’m glad you mentioned that because typically, I mean in my experience, when i’ve been the most comfortable like when I started my youtube channel or my podcast, or in public speaking or putting out blog that I wrote. those are really comfortable moments. they have always yielded incredible results. so i always feel like I need to put myself on a comfortable situations to get bigger results. you know higher risk yields higher rewards. but speaking of risk, i mean, what’s the worst that could happen. you put out on podcast, maybe you won’t get that many listeners, that’s fine, you tried it. try something else after that. Eric: got it. cool. so you know obviously you did everything when you’re starting out. you did everything on your own. when did you decide it was the right…what was the criteria you set for like, “i need a higher people now. i need to start on bringing people. Pat: i went through different stages with getting people to work for me because i remember at the beginning i know a lot of entrepreneurs like this. You know we don’t we want to everything yourself and i don’t know whether it’s not because we don’t we don’t trust other people to work on our stuff or at least for guys, I mean at least for guys. You know we won’t stop for asking for directions of we’re lost, we will try to figure out on our own. you got to a point where you realize that there are other important things that you should be doing other than those other things that you might not enjoy or you don’t know how to do. You know how to figure it out on your own. there are people out there who can help you do things much faster and much better than you could ever do which would give you more time to do things that you should be doing. i remember my first experience with a VA, a virtual assistant, was back in 2008 when i actually turned my ebook into an audio guide. that was sort of a product thinking. so at first, i wanted to do it and I had a microphone. I was like, okay, I’m just gonna read my book, and turn it into an audio book so i did that for three days and i listened to the final product. it was the worst… it was ridiculous. it was the worst audio ever. the quality was poor. i don’t know how but i was reading and i was still saying uhm and uh like in the middle of the sentences, like it didn’t make any sense, i couldn’t put it out there and so i asked people in the mastermind group. How am i gonna create an audio guide and they all laughed at me and they were like “you tried to do this to yourself? you should have hired somebody to do it for you. i didn’t even know that was possible?”. i was like, how do i do that? where do i go? and they were like “oh, you can find someone. you know, a filipino VA, or if it’s just a one time thing, which it was, you can go on a site elance and that’s what i did. I put a job up there for someone to read my audio guide and there’s all very different bids from like $500 to $3000 and i picked a woman who’s gonna read it for about $1500 and that was more money that i ever spent on anything business related at that time and i was like making money but i have never spent that kind of money on my business. i thought i was kind of ridiculous that i would spend… that i was gonna spend money on something that could possibly do on my own. like i could retake it or whatever. and retry a different brand but i didn’t and I’m so glad i did cause she turned in around in a week. it was super high quality and i sold it on it’s own on my site or package along with my ebook and i made up the cost on about two days. It was ridiculous because all i did was put out a job and i got the deliverables back and it was done. and that was my first sort of taste of using VAs and how do other people do stuff that either i didn’t now very well or didn’t know how to do at all or just shouldn’t be doing. and then, you know, just learning over time i’ve introduced more VAs into my team and people who can help me out with doing things that i couldn’t do on my own. and I’m more comfortable doing that now. like opening up a business for people who can do things even though i could do it myself because i know that my time is better spent doing bigger items or actually interacting with my audience. I suppose to doing research online or whatever. and now I’m at the point…because I always had projects that has a little bit of money, I actually have… let’s day like a producer or project manager who works with me on all the different times that I am working on to keep everything organized, who is sort of like my psychic brain, he’s kind of like those 31:19 which is perfect cause he make sure that I’m always on task and things like that because i mean I think I’m in a position where you know, part of my business is creating new businesses so i needed somebody to organize all that information for me. I also was like hiring my CPA to help me with taxes and accounting and book keeping. I mean, i would not survive without that person. and then also a lawyer if I needed some legal things create for a website or sort of whatever. i have that person on board with me and I just pay them when work happens. so I definitely couldn’t do this on my own, that’s for sure. and you got to get to a certain point where you realize that that’s the case. Eric: so last few questions before we wrap it up. so where did you get our VAs from like, was it like… what sites did you use? Pat: i used one site actually, you know there is a lot of site for one time gigs but for more permanent decisions or for things that you have to do over and over again i recommend hiring a VA from the Philippines. I’m half filipino. You know the understanding is that filipino culture they are they all speak english and they are really really loyal and they are the perfect VAs. And what’s crazy is just the sort off difference in how much think you might need to pay them. You know I actually pay my web developer about $700 a month for about 40 hours per week which is like ridiculous right and I actually was like surprised that this is the case because this is just the difference between the economies. Eric: Got it. virtualstafffinder.com. And how about uhm. What was I gonna ask. So what are some like productivity hacks that you can share with our audience. Pat: Sure I mean I already talked about a few things that are important. I mean we talked about you know little lines that are personal and I mean those are productivity tips. You know making sure you have a schedule. Making sure that you have a specific space to work in where you’re not going to be interrupted. Or you can get in to work mode. There are alot of you know productivity tips are huge for me because I have two kids and I only even x number of hours to work everyday and I make sure I don’t overwork. Eric: How many hours a day are you working right now? Pat: But if there is a particular project that there is a deadline coming up. Like recently with my course I was putting on 18 hours a day and you know. I would talk to my wife and say “Hey, I got this course coming out I will be working this many hours.” So she would take the kids more to understand and our schedules will change. A little bit and thats for those particular moments in time. And so for me it’s like you know if I’m coming out with something big and boom it’s out there and it’s doing thing. You know which is sort of the idea. I think the biggest thing for productivity for me and just this is gonna sound interesting you know is eating healthy and staying fit. I mean it sounds like it doesn’t matter or it shouldn’t but it absolutely does, I mean I found I’ve recently been training for a half marathon. I just ran a couple of weeks ago and during this training I was never more productive in my life when it came to work. I was never more focused. My ideas were just coming out of nowhere like I was so creative and it’s just like your body is like your machine you know. It’s what works and so you have to give it the right fuel you have to train it and it’s just incredible. I mean Richard Pranson was asked what’s your number one productivity tip and his answer was exercise. I mean one of the richest men in the world said that and obviously it means something and if you don’t believe me I’ll just challenge you to try for a month to eat healthy and you know or walk or run just a little bit everyday. You’re gonna see a change not only in physical on how you feel but just your work and how much you can focus like I can get 1 1/2 times more than now as a result of not sitting around in front of the computer but actually getting up and putting in the workouts and actually spending a little bit more time to eat well and you might think that you are losing time if you like spend an hour a day working out but your actually getting that time back later and it’s just much better you know. So so far that is the biggest productivity tool. Well one thing I do because I have so many projects also is that i have specific folders that I create for every different project with each of those projects I have physical folders and each of those folders has a sheet on it. A checklist which is sort of a path to where I am at now from the beginning all the way to the end and so the way I work is I’ll focus on one particular project. So I’ll pull off that folder wether it’s an iphone app or a course or whatever. You know this is the thing I’m focusing in on so it’s right there physical for me to see and I can see a checklist of you know sort my path on how to get from where I am at now to where I am going and was really the big idea behind this you know we have this big huge goals this big projects we have to complete. I chop them up to to little tiny goals and I actually have them physically there on a piece of paper so I check off and keeps me motivated to keep going and I can just focus on one thing at a time. One project at a time, one thing at a time the next absolute task. And so this is where this thing just in time learning comes in. where I know a lot entrepreneurs and so this is how I was at first. There’s so much information out there and information overload so many things to learn a lot of people running great content coming up with amazing videos and podcasts this and that and this. Well for me when I work on a specific project I see the next task on the list and if I don’t know how to do that or I’m trying to figure out how to that. That’s all I focus on. Nothing else ahead of that no projects. I’m just tuned on that. So what I try to do is come up with another email amazing podcast I don’t listen to it until it’s the right time if that is something that is still waiting. So I actually don’t have an RSS reader. I don’t subscribe to many podcasts. I just look for information when I need it.. And I got the resources. Or I go to my network and I will say “Hey do you guys know any good articles about youtube pinterest”. Okay well I then I just of the best content where I don’t have to filter them myself. So that’s a great productivity tip using those folders and also using your network to help you just trying to figure stuff on your own or find the best information. And also you know shaving as much as time that I can from the little things that I do that are repetitive so I use tools like google canned response or text expander to simply type in like 3 buttons and reply to something I would always reply to anyway. So I save my answers if you know I notice certain questions over and over again. It is really easy so it’s boom boom boom answer send. This email is time stuff for sure. It’s speaking in email a lot and also productivity in general. I like to do things in batches. So I’ll spend certain amount of time each day maybe an hour each day or even an hour every other day that’s my time to answer emails. That all I’m doing again that’s all I’m focusing on. Very taking that line to it’s spotlight and just focusing on one thing is probably the best tip I have Just everything else around is distracting and focus on that one thing and get it done. Eric: Got it. And this is coming who works on all this different projects. He’s written books and he’s got a big blog and all that so you could tell he’s not unfocused he’s really focused and that’s why he’s had success in so many different channels. The last question here. Final bit of advise for our you know our budding entrepreneurs and audience. We get punished for failing ever since we were little. But I think failing is good. Obviously we don’t want try to fail but if you fail it’s crucial that you understand why. You can paint it from there. Or do something different so that the next time we go on. Or however you move forward you don’t make the same mistake. I think failing is making the same mistake twice because you didn’t learn from your 1st mistake. So my advice to you would just be you know. Doing everything to succeed but understand that failure is part of the process. If you fail that’s good keep going and learn from those part experiences. Eric: Alright everyone. Thank you so much Pat. This is going to be really helpful for our audience I think they are really going to like it. So thanks again. Pat: Thanks for having me.